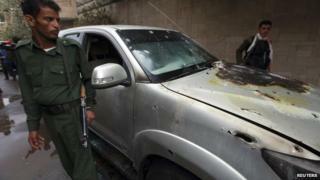 A French security agent has been killed and another seriously injured in the Yemeni capital, Sanaa. They were in a car protecting the European Union mission when they were shot at by unidentified men. A Yemeni driver was also wounded in the attack, described by French President Francois Hollande as "cowardly". Westerners have been targeted several times in recent months, including a German diplomat wounded in a shooting last Monday. The EU's foreign policy chief Catherine Ashton condemned the latest attack, carried out in the centre of the capital. "The EU's presence in Yemen aims only to assist the country in its transition to democracy and in its economic development. To target persons engaged in this effort is evil and senseless," she said. The shooting came as the Yemeni army continues an assault against al-Qaeda militants in the south of the country. The country's defence ministry said 37 militants had been killed in the operation so far. Al-Qaeda in the Arab Peninsula (AQAP) overran much of southern Yemen in 2011. It is considered to be the most dangerous branch of al-Qaeda.